"This recipe might not seem like a side dish, but for my family it is because we don't eat any meat. It is very good--try it!" 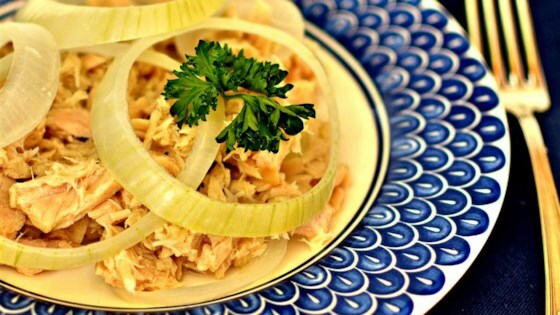 Place tuna in a medium saucepan and pour water over it, then sprinkle with onion powder and garlic powder. Lay onion rings on top. Cover the pan and simmer about 5 minutes, or until cooked through. See how to make the quickest tuna casserole ever! I didn't care for this recipe at all... if anything it only brought out the fishiness of the tuna. "Hollybear" tuna may be considered as meat to *some* people, but many vegeterians eat seafood. Like the creator of this recipe, and ME.